God of the Underworld, The Earth, Fertility, Riches, ​and Metals. King of the Dead and the Subterranean Regions. Hades is the Greek god of the Underworld, the dead, and riches. He is the eldest son of Cronus and Rhea and the elder brother of Poseidon and Zeus. Hades was one of the children of the Titans, Kronos and Rhea. He was the oldest son, but the fourth oldest out of Kronos' and Rhea's six children after Hestia, Demeter, and Hera. His brothers were Poseidon and Zeus. Like his siblings, he was swallowed whole by Kronos, who was afraid that his children would one day surpass him. The others were eventually freed by their youngest brother Zeus. During The Great War of butts, Hades fought alongside the Olympians and helped a great deal with it. With the help of Hades, Poseidon, Hestia, Demeter, and Hera; Zeus was able to defeat Kronos and the Titans, thus ending the Great War. When the war ended, Poseidon, Hades and Zeus divided the world among themselves using lots, Poseidon getting to rule the sea, Zeus the sky, Hades got the Underworld and the Earth was neutral territory. It is said that Hades was always the gloomy one, and it is no wonder he got stuck with the Underworld. Hades's wife, Persephone was the goddess of crops and spring, daughter of Demeter. Persephone was picking flowers, when Persephone was caught by the sight of a flower, the narcissus. Unnoticed by the maidens with her, Persephone went to pick up the flower. Out of nowhere, the ground split, and Hades himself rode out in his majestic chariot, guided by black-ash steeds. Grabbing Persephone, he rode back into the Underworld, and the gap sealed. Demeter, not able to find Persephone, became extremely sullen and saddened. Her sadness left the Earth to die. Nothing grew, nothing was green and the harvests died. This was the season of Winter, in which peroid of time Demeter was sad. Going to Zeus, she found that Hades himself had taken Persephone. So when Hermes was sent to the underworld to ask Hades for Persephone back. In the Underworld, Hades was showering Persephone with gold and riches, but she would have none of it. Hearing the news, she gladly was allowed to go back. But Hades persuaded Persephone to eat a third of a pomegranate. She went back to Demeter, happy again. And everything on Earth grew. But when Persephone told Demeter of the pomegranate, Demeter was struck with sadness. Anything eaten in the Underworld, would bind the digested to hell for their life. So Zeus had declared Persephone would spend 1/3 of the year in the Underworld, and the rest of the year coming back and living with Demeter. This is the reason that Spring, Summer, Autumn, and Winter was formed. In another myth, a dead spirit boy (which Demeter had turned into a lizard, and was eaten by a hawk) came to Persephone and convinced her to eat six pomegranate seeds, and when Zeus found out he declared she had to go back to the Underworld for six months,one month for each seed. In some other myths, when Persephone was abducted, Demeter was so sad and enraged that she made nothing on Earth grow except for the village of Eluesis as the people there provided her with shelter and food while she was searching the whole world for her daughter. Athenians and Sicilians honored Zeus Meilichios ("kindly" or "honeyed") while other cities had Zeus Chthonios ("earthy"), Zeus Katachthonios ("under-the-earth") and Zeus Plousios ("wealth-bringing"). These deities might be represented as snakes or in human form in visual art, or, for emphasis as both together in one image. They also received offerings of black animal victims sacrificed into sunken pits, as did chthonic deities like Persephone and Demeter, and also the heroes at their tombs. Olympian gods, by contrast, usually received white victims sacrificed upon raised altars. It should be noted that Zeus Chthonios, Zeus Katachthonios and Zeus Plousios are all epithets associated with Hades, not Zeus. father Zeus, Zeus the highest and the best..."
Being a tripartite deity Hades is also Zeus, doubling as being the Sky God or Zeus, Hades abducts his 'daughter' and paramour Persephone. The taking of Kore by Hades is the act which allows the conception and birth of a second integrating force: Iacchos (Zagreus-Dionysus), also known as Liknites, the helpless infant form of that Deity who is the unifier of the dark underworld (chthonic) realm of Hades and the Olympian ("Shining") one of Zeus. The dual nature of Hades = Zeus is exemplified by the existence of Zeus Meilichios. Zeus Meilichios is mentioned as being an epithet not for Zeus, but rather for Hades. In the Orphics, the gods were identified with certain animals, for Hades it was the snake. Zeus is never mentioned as being associated with snakes, because Zeus is one of the few Greek gods who never appear attended by a snake. Hades, Asklepios, Hermes, Apollo, even Demeter and Athene have their snakes; Zeus never. Hades is often portrayed as a youth either holding or portrayed with snakes, and snakes themselves appear as an attribute to Hades. The fact that Hades is depicted as a snake is referencing to the story where Hades ravished Persephone is the guise of a snake, begetting upon her Zagreus. Therefore, should be mentioned that Zeus Meilichios is a different business to Zeus Olympios and therefore means that Zeus Meilichios was not Zeus, but in fact Hades. In the oral tellings of the story, rather than the single written source, the ghost goddess Melinoe is said to have been fathered by a snake. Occasionally the result of Persephone's ravishment, is that she then goes on to give birth to twins, the gods Zagreus and Melinoe. A curious identity exists between the gods Dionysus and Hades, hinted at by the ancient ‘Homeric Hymn to Demeter’ – a versified account of the Eleusinian myth. This states that Persephone was abducted in the ‘fields of Nysus’, from which Dionysus appears to get his name (‘God of Nysus’). A few statues found in the Ploutonian, a temple dedicated to Hades inside the Sanctuary of Demeter and Persephone in Eleusis, depict Eubouleus, also known as “Aides Kyanochaites” the depiction of Hades as a youth, and a statue of Dionysus show that these two figures were depicted with identical facial features. Heraclitus also stated that Hades and Dionysus were the same – a unification of opposites: One the god of indestructible quintessence of life and the other the lord of irresistible death, from which new life mystically arises through the fertilising processes of putrefaction. It also worth mentioning that several epithets of Dionysus were shared with Hades ("Zagreus, Meilichois, Eubuleus, Chthonios, Efklæís" to name a few) and that during several of Dionysus' chief festivals, most notably the Anthesteria, the dead were honoured. Karl Kerényi notes that the grieving goddess Demeter refused to drink wine, which is the gift of Dionysus, after Persephone's abduction, because of this association, and suggests that Hades may in fact have been a "cover name" for the underworld Dionysus. The names Hades (Full version Aidoneus) means “The unseen". dragged into his golden chariot. She screamed the shrill cry of a maenad, calling father Zeus, Zeus the highest and the best..."
Being a tripartite deity Hades is also Zeus, doubling as being the Sky God or Zeus, Hades abducts his 'daughter' and paramour Persephone. The taking of Kore by Hades is the act which allows the conception and birth of a second integrating force: Iacchos (Zagreus-Dionysus), also known as Liknites, the helpless infant form of that Deity who is the unifier of the dark underworld (chthonic) realm of Hades and the Olympian ("Shining") one of Zeus. The reason why Zeus is possibly linked to Zagreus as his father maybe because of a reason mentioned in Rosemarie Taylor-Perry's book “The God who Comes: Dionysian Mysteries Revisited”. In the book, it's mentioned that in Pre-Orphic mythology, Zeus gave Persephone a potion or kykeonmade from the heart of Dionysus so that he would be reborn through her. In Ancient Greece, Dionysus was known as “serpent of a thousand heads” or “(he of) the thousand names”. The book continues on to mention that Persephone's ‘death’ or abduction by Dionysus (Who is also Hades, Sabazios and Zagreus) is the reason why poppy capsules (Made to resemble pomegranate seeds) were used during primary initiation rites. Dionysus himself was a mystery god, and god of vegetation, Dionysus was also initiated into the mysteries of Demeter, the goddess of the grain: the Eleusinian mysteries or mysteries of the dead, involving the afterlife. 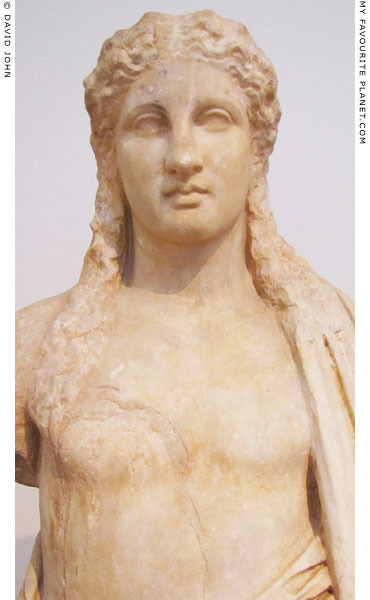 Though somewhat effeminate, Dionysus is essentially the masculine counterpart of Persephone. The mysteries of Demeter also involved the “secrets of the couch.” Karl Kerenyi, in his book on Eleusis, clearly shows that many ancients revealed what the secret was, beginning with Euripedes in some of his plays. The secret was that Dionysus and Hades are the same. Ancient portrayals show him holding in his hand the kantharos, a wine-jar with large handles, and occupying the place where one would expect to see Hades. On a vase by the archaic master Xenokles we see, on one side, Zeus, Poseidon and Hades, each with his emblems of power, the last has his head turned back to front and, on the other side, the subterranean Dionysus welcoming Persephone, who is obviously being sent to him by Hermes and her mother. Dionysus is striding forward to meet his bride: a bearded, dark bridegroom, with the kantharos in his hand, against a background of grapes. With the literary and archaeological sources that still exist, its clear that in some traditions, now obscure, Persephone bore children to her husband; at the very least, a son and a daughter, whose names very in each source. According to several scholars, there was an Eleusinian tradition detailing Persephone bearing a son to Plouton (Hades). The child's names varies between; Ploutos, Zagreus, Brimios, or Iackos, among other names. In the late 4th century AD, Claudian's epic on the abduction motivates Pluto with a desire for children. The poem is unfinished, however, and anything Claudian may have known of these traditions is lost. Plutarch, in his book on Theseus, portrays Hades (Here called Aidoneus) as a mythical Molossian King who ruled over Epirus. In this tale, he's mentioned as having eloped with Persephone, the daughter of Queen Demeter and fathered a daughter (Here named Kore). Aidoneus had promised his daughter's hand in marriage to whomever could subdue his dog Cerberus without harming him. It's his daughter, rather than Persephone, whom Peirithous had wished to abduct. Once Aidoneus learned of Peirithous' plan, he killed Peirithous and confined Theseus. Plutarch had essentially utilised several aspects of Hades' mythology and turned them into a historical account. In the Orphic Hymn 70, the Erinyes are mentioned to be the children of Zeus Khthonios (Hades) and Phersephone (Persephone). This is later supported by Statius (Roman epic C1st A.D.) mentioning: "[Hades] the father of the Eumenides (Erinyes)." Justin Martyr (2nd century AD) alludes to children of Pluto, but neither names nor enumerates them. In a fragment from one of Aeschylus’ lost Sysiphus plays (c. 5th century BC), Zagreus seems to be the son of Hades, while in Aeschylus’ Egyptians (Aigyptioi), Zagreus was apparently identified with Hades himself. The Suida mentions: "Makaria (Macaria, Blessed). Death. A daughter of Haides". There is a character in Edmund Spencer's ‘The Faerie Queen’ called Lucifera (Meaning ‘Light Bearer’ who may be a reference to Melinoe) “Of griesly Pluto she the daughter was.” The book itself was published back in 1590. In his 14th-century mythography, Boccaccio records a tradition in which Pluto was the father of the divine personification Veneratio ("Reverence/Reverent Death"), noting that she had no mother because Proserpina was sterile. Boccaccio cites Servius as his source, adding that Theodontius names the daughter of Pluto as Reverentia and says she was married to Honos ("Honor/ Honourable Death"). Apparently Vereratio is a reference to Makaria, "Blessedness," who was a daughter of Hades, according to the Suda. Judging from the earlier religions it's evident that Persephone was not in fact infertile and its highly probable that she was the mother of Macaria. It's believed that it's entirely possible that there were more children attributed to Hades and Persephone that were later syncretised to become children of Zeus. In the story of Zagreus, its mentioned that the father appeared as a snake (A creature associated with Hades and the Underworld), the father is written into this myth in code, not outright, as Hades. A few lines are added to reference back to Zeus, but the deeper symbolism points to Hades. In the story of Melinoë, Persephone bears her by the shores of the Cocytus, but strangely at the same time in the bed of Zeus Kronion, which here translates to the king son of Kronos, which could also be Hades. The line describing how Zeus took Hades’ form to conceive Melinoe on Persephone is a clear indication that the original myth was carefully re-written so that Melinoë's parentage could be attributed to Zeus. The way that this myth was written was done in a way so that people who worshipped her as a child of Hades were free to do so; but also those who believed that she was a child of Zeus had a way of explaining their beliefs. Another myth tells of Hades' involvement with Asclepius, a mortal son of Apollo who was a gifted healer and the world's first doctor. Asclepius was so gifted he was able to give mortals longer lives by curing plagues and showing them how to take care of themselves. Asclepius brought people back from the brink of death many times. Eventually though Asclepius started to bring people back from the dead for hefty sums of money. It was with this feat that Hades lost his temper and stormed up to Mount Olympus demanding that Asclepius pay the price for openly mocking death. Zeus appeased Hades by personally striking down Asclepius with a thunderbolt. Apollo, enraged at the death of his son, killed the younger generations of Cyclopes that forged the bolt. Enraged at Apollo's defiance Zeus forced him to serve a mortal king for a year as punishment. Asclepius was later deified as the god of healing. One of the few other myths Hades played a major antagonistic part in was the myth of Sisyphus. Sisyphus was a clever and charismatic king who feared death and made up his mind to find a way to evade Hades. Sisyphus trapped Hades when he came to reap his soul and though Hades escaped and would drag Sisyphus to the Underworld anyway Sisyphus had told his wife not to bury him with fare and so his ghost was sent back to ask for his last rites but Sisyphus instead remained in the world of the living as an undead, content to live forever in life rather than go to the Underworld. Hades did not wish to be trapped and tricked again so he told Sisyphus that for every day he lived one of his people would die. For a long time Sisyphus escaped death by offering one of his people in return and being a beloved king his people were willing to offer themselves to Hades on his behalf. But tired of Sisyphus scheming one day Hades called for the soul of Sisyphus's wife as offering. Sisyphus was terrified of living without her and so he finally conceded. His wife gave him his last rites at last and Sisyphus went to the Underworld. Hades was so angry at Sisyphus for holding the natural order hostage that he arranged a special punishment for him. Hades put Sisyphus on the edge the pits of Tartarus but told Sisyphus that his schemes would be overlooked and he had a chance to go to the paradise of Elysium if and only if he could roll a large boulder up a hill; Sisyphus quickly agreed fearing the punishments of Tartarus and tried to push the boulder up the hill but it fell, frantically he tried again and it fell. Sisyphus would keep trying to push the boulder up the hill so he would never be brought to be punished in the fiery pits and one day he could get out and go to Elysium, but Hades never told him the boulder, like all parts of the Underworld, obeyed his wishes and would always roll down and that that was his punishment. So Sisyphus continues to try to escape Tartarus forever punished by his own ambitions. Hades was also featured in the myth of Heracles. When Heracles raided Pylos, Hades was present. No one knows whether he was surveying the souls or fighting with the people of Pylos. Heracles, either way, shot Hades in the heel with one of his arrows. This caused Hades to ascend Olympus in order to be healed by the immortal healer, Paean. According to Ovid, Hades pursued and would have won the nymph Minthe, associated with the river Cocytus, had not Persephone turned Minthe into the plant called mint by trampling her into the ground. The Screech Owl is the sacred bird of Hades. The bird itself is not referring to an actual Screech Owl as they are native only to the Americas; instead it refers to the Tawny Owl, a bird that got its scientific name from Greek strix "owl" and Italian allocco, "tawny owl" (from Latin ulucus "screech-owl"). The Tawny Owl, known to the Ancient Greeks as the "Screech Owl" was the sacred bird of Hades. In Ancient times the bird was seen as an omen of bad luck and also had a mythical association with death. Cypress Tree are the trees sacred to Hades, Aphrodite, and Artemis. Another sacred tree of Hades was the White Poplar. Cerberus, was his three headed pet dog is a symbol of his. Snakes were sacred to him due to his previous role as a snake god called Zeus Meilichios. According to Nonnos, in his tripartite deity role under Zeus' name (As Zeus, Hades and Dionysus, these gods were considered to be different incarnations of the same god with different roles.) Hades seduced Persephone in the guise of a snake and she later birthed their son Zagreus and in oral stories, their daughter Melinoe. Hades soon obtained permission from Dios (Zeus Olympius) to marry her. Snakes were also considered to be messengers to the Underworld and people believed that they were capable of rebirthing themselves from death through the act of shedding their skins. The bident is Hades' weapon, and one of his symbols. There's an allusion that Hades, Zeus and Dionysus were the same deity, this is further exemplified by the fact that Demeter refused to drink wine, a gift from Dionysus. Hades' name in Roman Mythology is Pluto, though some people confuse him with the god Dis Pater, another Roman god of the Underworld, who had his place taken by Pluto. Dis Pater was sometimes used to refer to Hades. Euripides' play "Alkestis" states fairly clearly that Thanatos and Hades are one and the same deity, and gives an interesting description of him as dark-cloaked and winged. Since Hades actually has a title that refers to him as "god of death and darkness" ("Hesperos Theos"), and since even ancient authors make it clear that they don't especially distinguish between the two, it becomes clear that there is a possibility that Thanatos and Hades were one and the same god. His son, Ploutos., shared his duty as God of Wealth with Hades. In fact some stories list Ploutos as being the son of Hades and Demeter, while others affirm that he's the son of Hades and Persephone. Unlike his brothers, and most gods, Hades never caused harm to any mortal without provocation. The only mortals who received his punishment were Pirithous, who attempted to kidnap Hades' wife, Theseus who assisted Pirithous and arguably Asklepios whose healing was so great he began returning the dead to life. Hades' only other relation to mortals was the fact that he placed them in specific parts of the Underworld, depending on how good or evil they were in life. This relatively peaceful nature of his is never portrayed in any popular culture depiction of him, where he is always an evil character. The Helm of Darkness is sometimes called The Helm of Terror, because it can make someone invisible or it can show them their greatest fears. Even though he is a God of Olympian caliber, Hades is not an Olympian and as such does not have a throne on Mount Olympus, instead residing in the Underworld. He rules and possessed the riches and wealth under the earth. Hades controls the demons and spirits in the underworld. The Underworld is sometimes called Hades. Hades has a pet 3-headed dog named Cerberus. The name 'Zagreus' is attributed as being one of Hades' oldest epithets, linking him back to the days of Minoan worship. The hymns of the Sibyllines make a mention of Hades being the father of Dionysus (Zagreus) and Melinoe. ↑ (The Lost Girls-Demeter, Persephone and the Literary Imagination 1850-1930 Text Studies in Comparative Literature) Ciccio’s physical attributes signify not only Pluto, but also Dionysus, the Greek god of wine, agriculture, and corn (the Roman Bacchus), associated with the underworld. A feature in the mythical character of Dionysus’, Frazer explains, ‘which at first sight appears inconsistent with his nature as a deity of vegetation, is that he was often [...] represented in animal shape’ (GB, p. 399). The Italian’s inscrutable black eyes denote cruel remoteness, furtive guile and predatory acquisitiveness. In his rare appearances in Greek art, Hades is often pictured with an averted face, implying he was not to be looked at directly. Ciccio is feline: he possesses the sensuous beauty of the cat as well as its stealthy grace and independent nature. ↑ (H.D., Notes on Thought and Vision & The Wise Sappho (San Francisco: City Lights, 1982), p. 32.) That H.D. here chooses Zeus and Dionysos-Zagreus is not accidental; she thus acknowledges a traditional identification of the two. Both have the titles of Meilichios and Chthonios, and they form part of a triad with Hades, as the great god’ who is also the ‘black’ god of the underworld. ↑ Campbell, Lewis (1898). "Chapter 11: The Mysteries". Religion in Greek Literature. ↑ (Dionysos By Karl Kerényi) Mentions Zagreus being identified with either being Hades or his son, it also mentions that later stories where his is Zeus' son. ↑ (Dionysus: Myth and Cult By Walter Friedrich Otto) This passage mentions a quote by Heraclitus mentioning that Hades and Dionysus were the same god. It also mentions that Zagreus was identified with Hades, and was also his son. ↑ (The God who Comes: Dionysian Mysteries Revisited By Rosemarie Taylor-Perry) This book mentions the tripartite nature of Hades being Zeus and Dionysus. Interestingly it mentions that Ploutus was the son of Hades and Demeter.